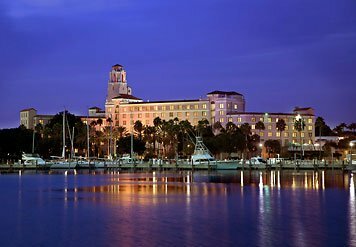 Happiness in the Making: Ahoy, Vinoy! The Renaissance Vinoy. You know…just a little shack off the bay filled with celebrities, signature cocktails, ocean views, waterfalls, steel drums, four different pools and bars, a spa that from the outside smelled of lavender, immaculate guest rooms, a fitness center that caused even me to think twice about working out and the kind of customer service that Walt D. himself would have even been proud of. Needless to say I’m still adjusting to the lack of little chocolates sprawled on my pillow (ok, and the fact there was no scolding when I got some on the white duvet), a fresh towel every morning complete with high-end bath products, the smell of fresh-cooked seafood wafting from the kitchen and whirlpool to dip my feet into after an 18-hour work day. Apparently this type of service doesn’t exist at Casa de Choate (though I am thankful for dinner on the table every night a la chef hubby). So, though I’m thrilled to be back to the regular 200 thread count sheets, sticky fingers and toothy grins, I’m longing for that little slice of heaven called 76 degrees, sunny and a five-star restaurant each night. In an effort to recreate it, I’ve posted similar signs around our home that request that no photographs or autographs be taken in an effort to respect the guests. So far so good…no one’s been around asking for the John Hancock of an exhausted, satisfied wife, Mother and employee. Though the little one still seems to be getting his fair share of flash time still these days. Guess the plan is kinda working.